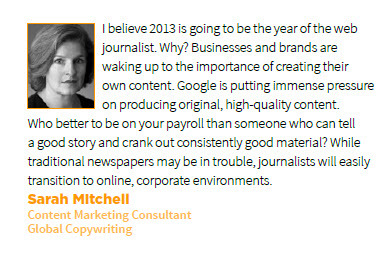 What’s In Store for Content Marketing in 2013? was originally published on BruceClay.com, home of expert search engine optimization tips. 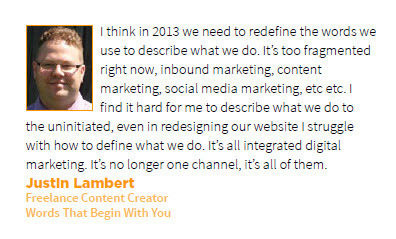 The Content Marketing Institute last week released 2013 predictions, where more than 80 marketers (including yours truly) weighed in on where the discipline was going in 2013. Journalists will have a new home in the corporate or agency environment. Visual content ramps up in the form of video and graphics. 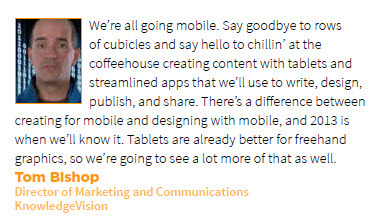 Creating content for mobile is key, along with other multiscreen options. Great business content that’s on par with big publishers will be key. The way we want to receive information is changing from the device (mobile) to the medium (visual) to the delivery (concise). Here’s the report on SlideShare. Scroll down for hand-picked predictions plus my take on them. We heard a lot of predictions in the CMI report about the demand for journalists, and how they will now have a home in the corporate or agency environment due to the brand publishing explosion. If the predictions are true, businesses will be putting a high value on writers – trained writers – and especially those that can use objective writing as in journalism, as well as investigate the company to find the stories and then go tell them. 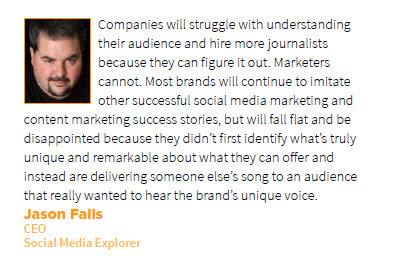 And while the journalist skill set in a company’s marketing and publishing department is a fantastic addition, it doesn’t necessarily mean a successful content marketing department. 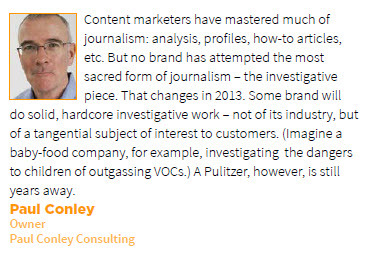 Businesses should turn to journalist skill sets as a viable options for well-written content and storytelling, but those journalists may not have the digital marketing strategy to execute content marketing on a full scale. My prediction is that businesses will need a healthy mix of skills sets on the content marketing team – publishing, journalism, editing, analytics, SEO, social media, writing, user experience, design and videography, and other Web marketing disciplines. At the helm of all those skill sets I mentioned previously should be someone who understands how all the moving parts fit together within a healthy digital marketing campaign; someone who can speak to the strategy and make sense of all the data to balance the content production with the business goals and audience. 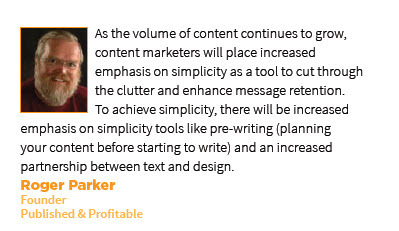 Several marketers predicted the way people wish to receive and produce content is changing and will continue to do so. Many statements had to do with the rise of video production and visuals, as well as more sophisticated execution of those types of content. So just as journalists will be in demand, I say graphic designers and videographers will continue to have a home as the need for visual storytelling becomes more and more important. Then there’s the rise of mobile consumption of content. Many predictions talked about the devices people will use to consume content, which means content needs to be responsive for multiscreen use. 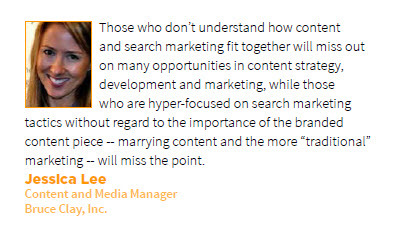 I also agreed with the predictions on Slideshare being a driver of content consumption. Think about it: Why wait until you have a presentation that you’ve unveiled to an audience? Any topic you have in your head can fleshed out in a PowerPoint, and the succinct nature caters to thin attention spans. Could slide decks be the new blog post? In a prediction by David Dunworth, he talks about visuals trumping the written word as a form of learning. I would add to that comment by saying that I believe we are going to have to take into account various personas and learning styles to cater the content deliverable (words, visuals, video) we present on the same topic. All of this is to say that the way we think about creating our content will need to change, from the way our text is laid out, to the type of content we create and the way content is written and delivered, where simplicity, entertainment, ease of use and engagement could trump in-depth, how-to content for the purposes of authoritative content. 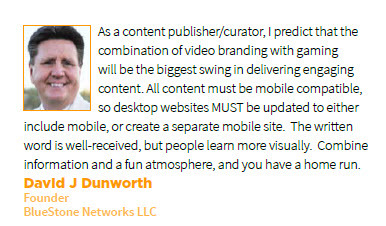 What’s your prediction for content in 2013? Weigh in in the comments below!